If you thought that totes were only suitable for the beach, this one will change your mind! With a classy look and stunning colors, our monogram ready faux-leather tote is ideal to carry into that boardroom meeting or out to a girls luncheon. This 2 in 1 fashion tote with a smaller cross body bag has a zipper closure, adjustable and removable shoulder strap with herringbone lining. Gold tone accents, dual handles and bottom metal feet on the larger bag. The two-tone design sports a delightful top faux leather in your choice of gray or coral with the popular cork contrasting bottom. Scallops along the top add an ultra-cool feminine look that compliments the curved handle. Perfect to carry your notepad, stationery items, mobile phone and more, you are all set for business or a casual day out! Faux leather monogram tote bag measures 13.7"W x 12.5"H x 4.3" across the bottom. 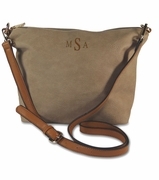 The 2nd bag included with purchase is a cross body bag, it measures 14" x 9.5" x 4" across bottom.